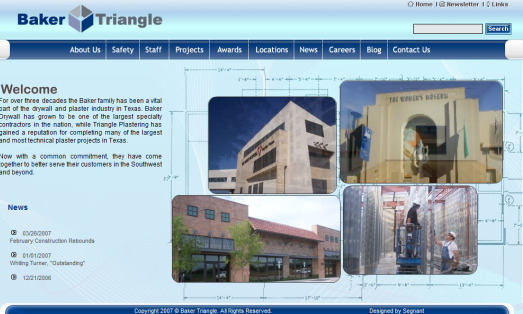 Baker Triangle joins two companies--Baker Drywall and Triangle Plastering. Baker Drywall has grown to be one of the largest specialty contractors in the nation, while Triangle Plastering has gained a reputation for completing many of the largest and most technical plaster projects in Texas. 3. Projects section: This section allows users to see Projects photos and descriptions by type and location. 4. News: Users can view press releases and announcements. Segnant gave Baker Triangle the ability to display all of their past and present projects, awards, news, and prominent employees. They are also able to send out a monthly newsletter highlighting news and featured projects.